February 3, 2015 – It has to happen eventually. Your first phone call! You’re really in the pet sitting business now. So how do you envision it? Are you talking on your house phone…your cell? 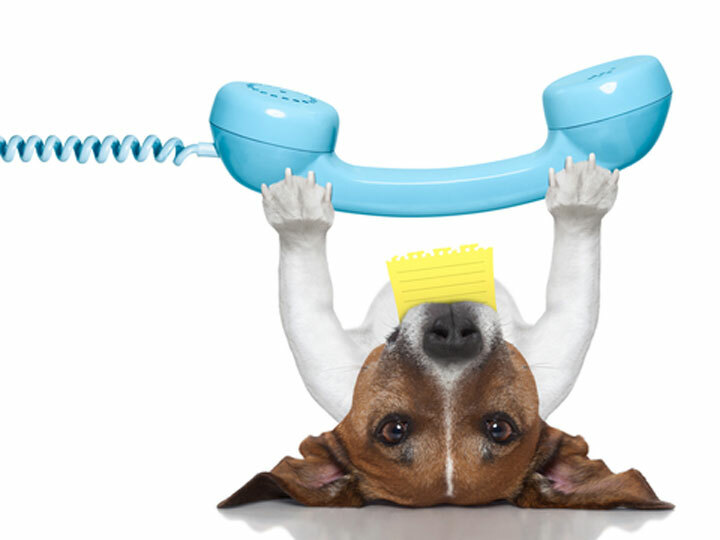 Much of your pet sitting administrative work will be done by phone. You’ll get a few emails, and many re-bookings are done by texts, but the initial contact is most often through a phone call. Even if the person finds you on your website, you will soon be talking. Prepare yourself and your business to look professional right from the start on the phone. Invest in a separate phone line even if you forward it to your cell. Ask about virtual numbers which means there is no land-line. They’re much less expensive and they are considered business lines so you can put your company name on it. The person calling has probably never phoned for a pet sitter and might be nervous. Just relax! Smile. It helps. Before they get too far into their conversation, try to determine what exactly the prospective client needs and in what general area they live if it’s for pet sitting at their home. They might not realize you don’t cover their region. Once you get more established, you can form alliances with other sitters in different areas to refer to. This is wonderful customer service and results in an almost immediate “yes” for the other sitter. We do this all the time. Plus, it feels good to know you’ve helped direct someone and their animal to a person you trust. You want to be polite, but if you notice them ramble, gently guide the conversation to what you need to know. Often they think they are the only ones on earth who love their dogs and cats like children and can’t imagine we truly understand. They need to get that across to you before they’ll feel better. The person’s name. The last name too if they are setting up an appointment – otherwise I don’t push for it. The general area they live in to ensure we service that area if it is to be pet sitting and not boarding. What their immediate needs are such as daily walks, an upcoming weekend to look after their dog or cats, boarding at our home. The dog’s breed and name. I work this into the conversation so they won’t feel I’m making a file on them. Some people get defensive quickly. I explain what we do and our rates, and if they would like to proceed we can set up a time to meet. If they would like to do the meet-and-greet… I try to remember to ask for their address. Sometimes we’re laughing and so relaxed after the initial nerves that I totally forget and have to call or email back so I know where to go. It happens. Also at this point I’ll ensure I have the best phone numbers for getting hold of them and I ask for their email address if they use one frequently. I don’t push for this either. Some people are more assertive than others and will have researched things to ask you as a pet sitter…as they should. They’re about to give you a key to their home and they don’t know you at all. In part two of this first phone call article, we’ll go through several of the questions you might be asked so you can be ready…or even pop them into your conversation up front. Once you’ve gone through what they need during the phone call, and you’ve decided you can help them, it’s time to request a meet-and-greet so the new client and the animal can get to know you better in person and you can fill out the paperwork. In a future article we’ll look in-depth at how to run a meet-and-greet appointment, but for now, think of it as a time to smile and show your confidence, be friendly with the animals, and talk about what is part of your service at each visit as you go through the paperwork. The potential clients will be sizing you up and you’ll be doing the same. And that’s it! So join us for future articles on the first phone call and the pet sitting meet-and-greet visit. This is day 34 in the 365 and it was a busy one. A last minute caller needing three visits made things hectic on top of our regular lunch schedule and a morning meeting. But it worked out as it always does…and that’s what chocolate was created for!